There’s no theology in today’s post, just a down-to-earth, run-of-the-mill rant. Well, maybe I could bring in something from Solomon’s wisdom literature to apply. But that’s not the point of this post. 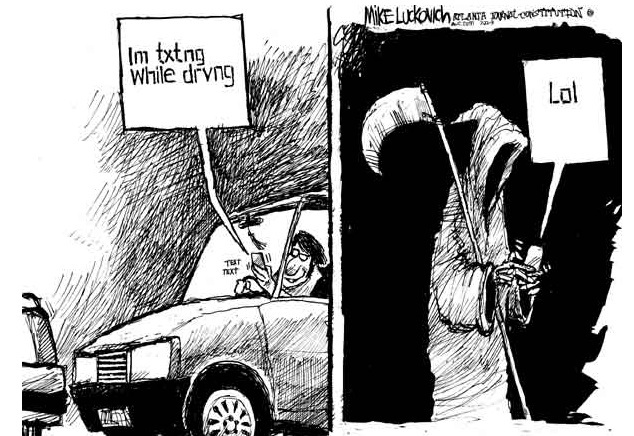 When I use the phrase “texting and driving,” chances are the majority of readers will admit to having done this behavior at some point in the past. Studies show that approximately 50% of the readers of this post text while driving. 77% of you think you can do it safely. I’ll confess, there was a time in my young and foolish life where I too texted while driving. In fact, you might say I was one of the worst of offenders as I have at times had multiple electronic distractions on in my car at one time. Stupid, stupid Ben. Sometimes, I still fall into the trap of looking at my phone when I’m not at a full stop. For the last 8 months, I’ve had a new job that has added a significant amount of time to my daily commute. By significant I mean that I used to walk to work in under 10 minutes, now it takes me about 35 minutes to drive each way. It is a daily occurrence for me to hit a traffic snare caused by an accident. Now, I get it, they’re called “accidents” for a reason – but I don’t think that term can apply when we’re just being stupid. When we herp-a-derp and drive, bad things happen. Texting and driving is the biggest offense of stupid “herp-a-derp” of our time. Seriously, are the numbers not enough to scare us away from doing it? Studies show that at least 23% of all accidents are caused by texting and driving. Other studies show that 18% of fatal accidents involved driver distraction. If I told you that you had a 23% chance of getting into a serious accident and possibly death from doing ANYTHING else, would you do it? I would even give up meat and cheese if statistics showed I was 23% more likely to go to the ER from eathing them! If a large percentage like this is enough to make you give up other behaviours, then why not texting and driving?